Extra gentle, organic nappy rash cream for babies, made from 100% Organic Extra Virgin Oil with Hipericum (St.John’s Wort) and Calendula flower extracts. Olive Oil is a well-known moisturising ingredient, Hipericum (St.John’s Wort) is a natural excellent skin repairing ingredient and Calendula flowers are fantastic for its anti-inflammatory benefits . Non-scented to avoid allergic reactions, redness and itchiness. 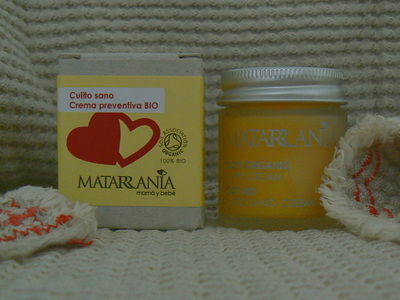 MATARRANIA is an exclusive range of cosmetics made in Spain, from 100% Organic Extra Virgin Olive Oil, which protects and cares for your skin. All the cosmetics are uniquely water free meaning its powerful ingredients are not diluted resulting in a slow absorption into the skin. INCI: Olea europea (olive) fruit oil* and calendula officinalis (marigold) flower extract* and Hipericum perforatum (st. john’s wort) extract*, Heliantus annus (sunflower) seed oil*, Prunus amygdalus dulcis (almonds) oil*, Sesamum indicum (sesame) oil*, cera alba (beeswax)*. *100% of ingredients proceed from Organic farming . Fragrance and perfume free.